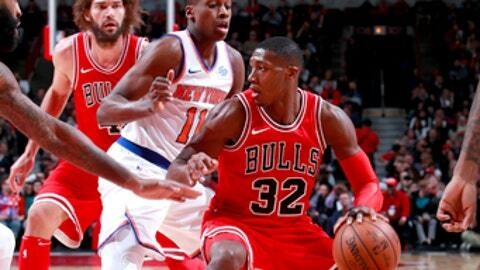 CHICAGO (AP) Kris Dunn is a key piece of the Chicago Bulls’ rebuilding effort. He wants to be a key to the team’s success. Coach Fred Hoiberg put the ball in Dunn’s hands during the final possession and the second-year point guard was fouled by Courtney Lee while driving to the basket. Following a timeout, the Knicks – who scored 10 straight points to tie it at 102 – had a chance to tie or take the lead, but Kristaps Porzingis missed a 3-pointer at the buzzer. Nikola Mirotic, in just his second game of the season, had 19 points to help Chicago win its second straight. Dunn finished with 17 points, nine assists and seven rebounds, and Luari Markkanen and David Nwaba had 15 points apiece. Nwaba had 11 points in the fourth quarter. ”I’m proud of the guys for finding a way to hang on there,” Hoiberg said. Porzingis had 23 points for New York. The Knicks are 1-8 on the road. The Bulls are 5-20, but 2-0 with Mirotic. The winter storm moving across the Eastern portion of the country this weekend created a travel nightmare for the Bulls following the win at Charlotte. The team had to stay over Friday night and didn’t land in Chicago until after 2 o’clock Saturday afternoon. Knicks: Host Atlanta on Sunday night. Bulls: Host Boston on Monday night.